When author Joe Sinclair turned sixty-two years old, he began his quest to run as many marathons as possible. Less than five years later, he has logged more than four thousand miles, participating in more than 150 marathons. In his memoir, Putting Life on the Finish Line, he tells his life story from his early years through his late sixties and details how he achieved his running goals. Sinclair shares running’s rewards and challenges—crossing the finish line at the toughest marathon in America run entirely on asphalt; completing three marathons in three days in the hot July weather; fighting off attacks by vicious dogs during a lonely, rural, mountain marathon; and helping a struggling young marathoner achieve his very first marathon finish. Offering personal secrets for success, tips and tricks, nutritional and fitness plans, pre-race plans, and inspiring stories, Putting Life on the Finish Line provides encouragement for those who believe they are too old to accomplish a dream. It shows that personal health and fitness is attainable at any age. I try to be a “people Person” and an “everyday Joe”. Sometimes I am short on patience! I have been writing guest columns for running magazines for about five years. Since my days in graduate school. I believed that I had something to contribute to individuals who wanted to improve their health and to those who were into fitness and running. At an early age, friends and teachers encouraged me to begin writing. I wanted to share my experiences in hopes that they would help to motivate others. The unique title was a thought about living a healthy life as a result of motivating myself to finish the tasks before me. I am currently completing my second book, “The Marathon Called Educational Leadership” which is taking much of my time. Organizing the content in an orderly manner. Did you learn anything while writing your book? If so, what was it? I learned to be more patient and understanding of the complex process of publishing. Give us three “Good to Know” facts about you. Be creative, you can talk about your first job, something that inspires you, anything fun that might grab the readers attention. I have completed over 160 marathons since my 62nd birthday I was a school superintendent at age 32. I met with President Ronald Reagan in the Oval Office. 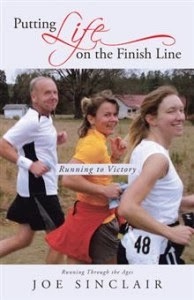 The cover of my book is an actual photograph of two of my friends running the Ellerbe Springs Marathon with me. Joe Sinclair has had an education career that spanned more than forty-five years. He served as superintendent of schools in various North Carolina districts for more than twenty years. In 1992, he was selected as North Carolina’s Superintendent of the Year. He and his wife, Claryce, live in Statesville, North Carolina. Win a $25 Amazon Gift Card or Paypal Cash and 1 of 10 free copies of his eBook! This giveaway begins October 21 - January 1. Winners will be contacted via email on Thursday, January 2, 2014. There could have been some error while you write news letter or others educationl papers first time. But, you'll be improve day by day that is good. https://www.waiverletter.net/advice-to-write-a-perfect-gmat-waiver-mba/ but very least of people know about her and those days she was passed by. I’m glad you write about this even in the tough world situations in a suspense/mystery novel. I love your writing, thanks for the giveaway. browse around this site where you will get some help on the readmission side of yours. If you are going to give you writing resource to the education site the come to this place. http://www.essaycorrector.com/correct-errors-with-our-essay-grammar-checker/ then you might be in the right place as this article will help you to do things at your middle school. I have no doubt about your skills but its been about so long that your content http://www.copychecker.org/originality-checker-free-avoid-plagiarism-tutorials/ skills are feeling me so low which is not positive. I have worked a log for infographics for an site website basically it was for academic students.I liked your informative post.Really an amazing stuff.